Samuel Johnson once famously said that patriotism is the last refuge of a scoundrel. It is not known in what the precise context was in which Johnson made this statement. 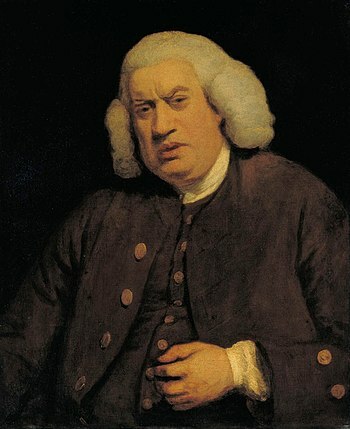 He was not disparaging patriotism in general, since he considered himself to be a patriotic Englishman. It is most likely that he said in the the course of a discussion on politics. Perhaps he was referring to a politician who he believed was not really a patriot, but who found it convenient to pose as one. Whatever the context, it is true that scoundrels of all sorts have tried to conceal their motives and actions under a cloak of patriotism. Speaking of patriotism and scoundrels, here is an e-mail I received from Organizing for Action the other day. What Walgreens did last week was a big deal. The pharmacy giant publicly decided to do the right thing by refusing to exploit a tax loophole. The loophole — called a tax inversion — is when a company in the United States purchases a foreign company, and then claims residency in that country for tax purposes. It’s something that could cost our country $20 billion over the next 10 years. Right now, dozens of American businesses across the country are weighing this decision. This is an important time to take a stand — say you’ll fight for closing corporate tax loopholes and help make sure everybody pays their fair share and plays by the same rules. The companies that take advantage of tax inversions don’t have to move their headquarters or CEO. They can continue to enjoy all the benefits of operating in our country while drastically cutting how much they contribute in taxes. That means when they “leave,” you and I get stuck with paying an even bigger share of the bills for things our country needs, like funding for our roads and bridges. That’s why it’s so heartening to see a company as big as Walgreens reject tax inversions. The more Americans who stand up and make their voices heard, the more that other companies will choose to do the right thing. Patriotism, like justice, is a noun that does not usually require any modifier. If someone modifies the word justice with adjectives to make phases like social justice, climate justice, or food justice, justice is not really what they have in mind. Likewise, adding an adjective to patriotism to make something like economic patriotism might indicate that the speaker is not really interested in patriotism, as it is generally understood. They wish to use patriotism as a way to shame or coerce people to work against their own interests or to respond to bad policies. In this case, the people behind Organizing for Action, the Obama administration, have done their best to make the United States a hostile place for businesses and then are surprised when businesses decide to relocate to places with a better business climate or take advantage of every loophole to lower their tax bill. One obvious way to encourage businesses to stay in the United States might be to lower the corporate tax rate. Right now, at 39.1 % the US has the highest corporate tax rate in the developed world. I know that most businesses don’t actually pay that rate, but surely finding ways to reduce their tax bills must be expensive and burdensome. If we were to lower that tax rate to something they would pay while decreasing the number of loopholes, everyone might benefit. It is better to tax people, and corporations, at a lower rate they will pay than a higher rate they will only seek to evade. But, it is easier to appeal to economic patriotism than to change bad policies, especially if you happen to be a scoundrel.